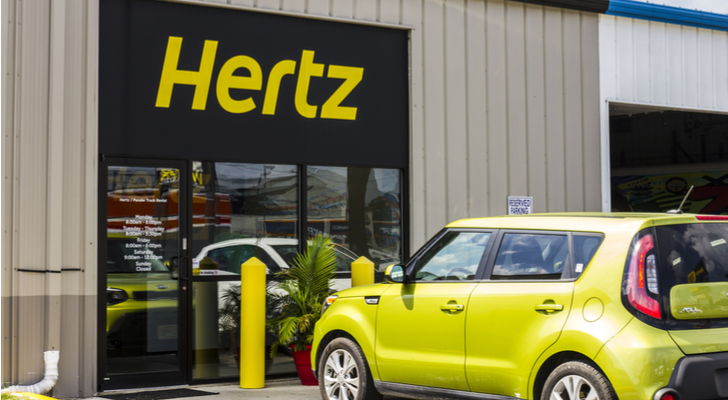 Hertz Global (NYSE:HTZ) blew away earnings and revenue estimates for both the fourth quarter of 2018 and the full calendar year. The automobile rental company saw its spike higher immediately in after-hours trading. Although this sent Hertz stock initially higher, the equity now trades closer to the top of its long-held range. Hence, for the Hertz, Dollar, and Thrifty brands to move higher, it will need to escape this range before it can sustain a rally. Hertz stock opened trading 7% ahead of yesterday’s close following its earnings beat before falling back. For the fourth quarter, the Estero, Florida-based firm reported a loss of 55 cents per share. This showed an unexpected improvement as the company had lost 77 cents per share in the same quarter last year. Analysts had expected a loss of 90 cents per share. Revenues of $2.29 billion also blew away estimates and rose by 9.6% from the $2.09 billion in revenue in the fourth quarter of 2017. Analysts had expected $2.15 billion in revenue. For 2018, the company reported revenues of $9.5 billion, beating expectations by $150 million. Earnings also came in ahead of estimates. HTZ lost 17 cents per share, 35 cents per share ahead of the 52-cent per share loss analysts had expected. In 2017, the company lost $1.59 per share and reported revenues of $8.8 billion. Hertz stock has suffered since it peaked at over $125 per share in late 2014. The rise of rideshare services such as Uber and Lyft have reduced overall demand for rentals. Weak rental pricing and depreciation costs associated with its fleet also contributed to losses. As a result, HTZ stock still trades more than 80% below its 2014 high. While the massive swoon eventually ended, HTZ has traded in a range for the last two years. Hertz has risen substantially from the $13.05 low it saw in late December. However, the post-earnings spike still leaves it short of the 52-week high HTZ saw last spring. Some degree of optimism has returned to the sector. Avis (NASDAQ:CAR) received an upgrade from Goldman Sachs earlier in the month. Goldman declined to upgrade HTZ at that time on the belief that Hertz stock would miss estimates. Not only did Hertz stock beat estimates, analysts now believe it will return to profitability in 2019. Thanks to this profit recovery, Wall Street predicts 200% profit growth for 2019. It also forecasts that profits will see an average growth rate of 85.7% per year over the next five years. With those increases in store, I do not see the current forward price-to-earnings (P/E) ratio of 37.1. Still, the range-bound nature of the stock concerns me. Today’s surge takes the Hertz stock price closer to the top of the range. For this reason, I do not think buyers should get in without knowing that HTZ has broken out of this range. If I were to buy, I would want to wait to see the stock maintain a price above the 2017 high of $27.27 per share. After years of stagnation, Hertz stock may have finally positioned itself for sustained growth. The noticeable beat on earnings for both the fourth quarter and 2018 sent HTZ stock shooting higher in after-hours trading and at the morning open. Though losses remain, analysts predict it will again move to profitability in 2019. The stock suffered for years amid the rise of ridesharing and the weak pricing in the rental car market. Now, the price of Hertz stock accounts for those factors. Today, it appears HTZ has figured out how to turn a profit in an environment where many have turned to ridesharing. However, before we can declare recovery, investors must remember that Hertz stock remains range-bound. It has not exceeded $30 per share since 2016 and has rarely traded above $25 per share in that time. If it can return to multi-year highs, I see little else that can stop Hertz stock. Article printed from InvestorPlace Media, https://investorplace.com/2019/02/following-beat-hertz-stock-one-thing/.